Here's an easy-to-use tool for sketching out your musical ideas in your workstation software of choice. Here's an easy-to-use tool for sketching out your musical ideas in your workstation software of choice. Samson's 25-key Graphite M25 is only about the size of a computer keyboard, and it's powered off of USB, so it can go practically anywhere you go. Connect it to a Windows® laptop, a MacBook®, or even your iPad® (when you add Apple's Camera Connection Kit), and then you can make music wherever it's convenient. The M25's velocity-sensitive keys give you immediate access to a two-octave range of notes, and the dedicated octave button lets you expand that range farther. Its four velocity-sensitive trigger pads are useful for tapping out drum parts or launching samples or loops. Eight fully assignable knobs give you further hands-on control of your DAW, and you can save up to four custom mapping presets using the included editor software for instant recall at the touch of a button. 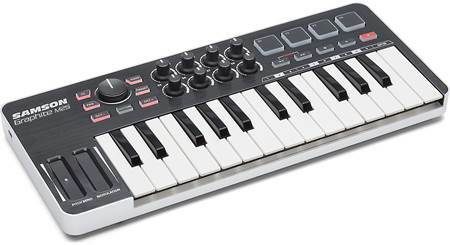 Overview: The Samson Graphite M25 is an ultra-portable USB MIDI controller for your home or portable studio. 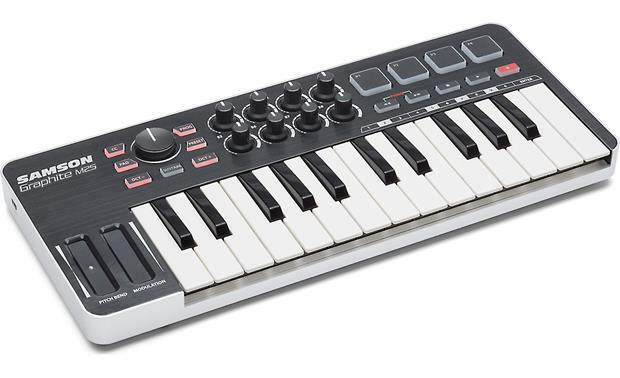 In addition to the 25-key, velocity-sensitive mini keyboard, the Graphite M25 is equipped with a full-featured control surface, trigger pads, and programmable functions. It can be powered by your computer's USB port, or directly by an iPad (Apple Lightning-to-USB Camera Adapter required). A 40" USB cable is included. 4 Trigger Pads: The four velocity-sensitive trigger pads with aftertouch can send MIDI note, velocity, and aftertouch messages. When the CC button is pressed, the pads send control change information. 5 Transport Buttons: The five transport control universal Rewind, Fast Forward, Stop, Play, and Record functions in the factory default setting. Pressing Rewind and Fast Forward together sends a Panic command to all ports and channels to clear a hanging or stuck note. 8 Assignable Knobs: The eight rotary knobs, labeled E1 through E8, send continuous control change data. Using the four presets, you can set up to 32 different parameters. Master Encoder: This large rotary Master Encoder is preset from the factory to send volume messages on MIDI channel 9. It can be assigned to control different parameters using the computer editor. PROG Button: The Program button sends program change information via the Function keys (0-9, Enter). When pressed, the button lights red and the keys will not send note information. Preset Button: The Preset button lets you select one of the four available presets. The presets have unique parameters assigned to the Trigger Pads, Transport Buttons, Assignable Knobs, and Modulation Ribbon strip. CC Button: The CC button changes the functionality of the Trigger Pads. When pressed, the CC button lights red and the Trigger Pads change from sending note information to control change information. Pad Button: The Trigger Pads are configured into two pad banks, each with different settings configured to each pad. Pressing the Pad button lets you toggle between the two banks of settings. Sustain Button: The Sustain button will hold or sustain the currently held notes. Pressing the button again releases the sustain function and the notes stop playing. Pitch Bend and Modulation Ribbon Strips: The Ribbon Strips send information as you slide your fingertip up or down the strip. You can raise or lower the pitch of notes played on the keyboard by sliding your finger up or down the Pitch Bend strip. The Modulation strip is used to add vibrato or other expressive effects to a sound being played. Function Keys: In Program mode, the last 11 keys of the keyboard are assigned to numerical digits (0-9), and the Enter function. To send a program change message, press the PROG button and the program number digit, then press Enter to transmit the program number information. Once the message is sent, the unit will exit the program and the Function keys will revert to transmitting note information again. Software: Samson's Graphite Mini Editor Software can be downloaded for free from Samson's website. You can use this software to customize your MIDI workflow by creating presets on the editor and saving them to the Graphite M25. The software is compatible with Windows and Mac. 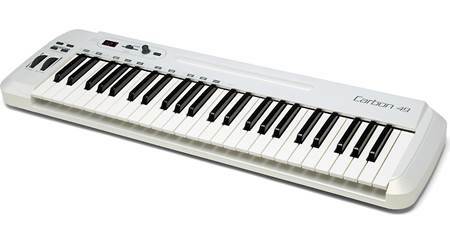 Searches related to the Samson Graphite M25 Mini USB MIDI keyboard controller.